I used stuff I already had around the house. No special trip to the store. Turn your crock pot on high and add a can of chick stock. Throw in your pork, chopped potatoes, chopped or baby carrots, and green beans. 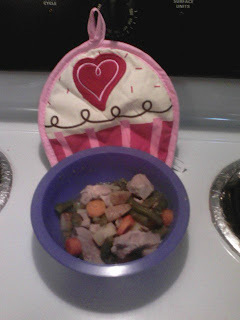 If cooking day of leave on high for five hours or until pork is cooked through and veggies are soft. See I told you it would be simple. oh thank you for sharing this recipe! we are in the midst of an ice storm and this looks like the perfect warm-me-up dinner! Happy blogging! This looks great. I don't use pork a lot...what kind of pork do you use for this??? This sounds delicious! :) It's cold here now too... So this would be perfect for tonight's dinner! Stopping by from Tasty Tuesday! Nichole Fleming. Powered by Blogger.